Hello, forex friends! The March NFP report is finally out, and it looked awesome (at least on the surface). The Greenback failed to soar like an eagle, however, so it’s time to take a look at the details of the NFP report to see if there are any hints that can explain the Greenback’s wonky forex price action. Well, the net increase in non-farm employment didn’t really match or exceed February’s upwardly revised 245K figure (242K originally), but we did see an upside surprise since the reading for March came in at 215K, which is better than the expected 202K net increase. Wages also grew at a faster-than-expected pace, increasing by 0.3% (0.2% expected) after a 0.1% slide previously. The biggest job contributor was the education and health services industry, which added 51K jobs in March, of which 44K came from health care and social assistance. This is followed by the retail trade and leisure and hospitality industries, which are both low-income industries. Of the 40K gain in the leisure and hospitality industry, for example, 24.8K jobs were contributed by food services and drinking places, which employ bartenders, waitresses, and McDonald’s burger flippers. These are minimum wage jobs (more often than not). As for the retail trade industry, gas station attendants and the small army of sales personnel at large department stores don’t really get paid a lot. But at least it’s a good sign that retail sales may be picking up or is anticipated to pick up. Moving on, the 33K increase from professional and business services looks very good since that industry tends to pay well. However, an even closer look at the NFP report shows that a large chunk (12.5K to be more exact) came from services to building and dwellings. These types of jobs include plumbers, pest exterminators, and landscapers, which are generally lower-income jobs (mid-income or better, if they’re really good or highly experienced). In summary, the service sector contributed the most number of jobs (as usual), but a large number of them are lower-income jobs (as usual). The service sector may be doing well, but the manufacturing sector is down in the dumps since it shed 29k jobs after letting go of 18K jobs back in February. 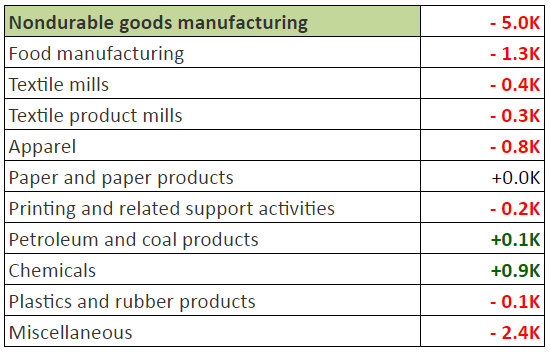 This marks the second straight month that the manufacturing sector saw job losses. Not only that, the job loss was broad, with almost all manufacturing industries getting hit. Oh, did I mention that the 29K loss in manufacturing jobs is the biggest ever on record since 2009? Yowza! It remains to be seen if this will negatively affect manufacturing production in the months to come, though. The jobless rate ticked higher to 5.0% from 4.9% in March. Wait, what? Yep, you read that right. The jobless rate ticked higher even though the U.S. economy saw a net gain in employment for the 66th straight month now. That’s A-okay, though, since that was very likely due to the labor force participation rate also ticking higher for the fourth consecutive month to a two-year high of 63.0%, with 396K civilians entering (or reentering, as the case may be) the labor force, but total jobs (including farm jobs, duh!) created in March was only around 246K. This is good since it could mean that the U.S. economy is doing well enough that Americans are getting encouraged to find work, but it’s also bad because the U.S. economy wasn’t able to absorb the stream of workers. But if you’re really cynical, then the influx of workers is bad on both counts since the economy wasn’t able to absorb the influx of workers and it’s possible that Americans were forced to look for jobs, or they’ll starve otherwise. This is so because half a million Americans are no longer eligible for food stamps and other out-of-work benefits starting on April 1. And that’s not a sick April Fool’s joke from the government, by the way, since up to a million people could lose unemployment benefits this year alone, as States reimpose the pre-recession requirements for such benefits. The headline numbers were pretty sweet, so forex traders naturally pounced on the Greenback as an initial reaction, sending it higher against its forex rivals. The Greenback had difficulty against the Japanese yen, however, probably because the yen was getting safe-haven flows, given that European equity indices were apparently tracking the painful oil price slump on Friday, with European equity indices tumbling to one-month lows. The Greenback got another bullish boost when the ISM manufacturing PMI reading came in better-than-expected. Interestingly enough, the Greenback’s bullish momentum failed to gain traction. Heck, the Greenback even began to give back its gains when the European markets closed shop for the week, which implies that European forex traders were taking profits off the table to avoid weekend risk. However, this could also imply that Yellen’s dovish tone is still weighing down on the Greenback. 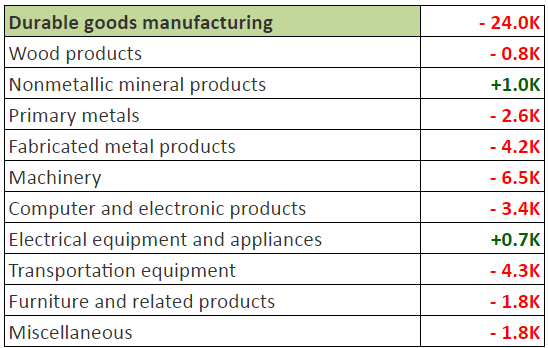 It’s also possible that forex traders took a long and hard look at the details of the report and concluded that everything’s not as upbeat as the headline numbers show, especially the large job shedding in the manufacturing sector. Either way, it shows that forex traders are not that confident to hold onto their Greenback longs over the weekend. Makes you wonder how the Greenback will perform next week, huh?